Benchmarking of competitors' web sites is vital in positioning your web site to compete effectively with competitors that already have web sites. Given the importance of this activity, criteria for performing benchmarking have been described in Chapters 2 and 4. • Financial performance (available from About Us, investor relations and electronic copies of company reports) - this information is also available from intermediary sites such as finance information or share dealing sites such as Interactive Trader International (www.iii.com) or Bloomberg (www.bloomberg.com) for major quoted companies. • Marketplace performance - market share and sales trends and, significantly, the proportion of sales achieved through the Internet. This may not be available directly on the web site, but may need the use of other online sources. For example, new entrant to European aviation easyJet (www.easyjet.com) achieved over two-thirds of its sales via the web site and competitors needed to respond to this. • Business and revenue models (see Chapter 6) - do these differ from other marketplace players? 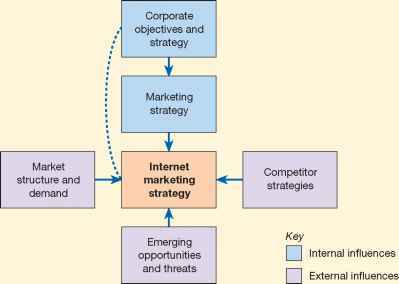 • Marketing communications techniques - is the customer value proposition of the site clear? Does the site support all stages of the buying decision from customers who are unfamiliar with the company through to existing customers? Are special promotions used on a monthly or periodic basis? Beyond the competitor's site, how do they make use of intermediary sites to promote and deliver their services? • Services offered - what is offered beyond brochureware? Is online purchase possible? What is the level of online customer support and how much technical information is available? • Implementation of services - these are the practical features of site design that are described in this chapter, such as aesthetics, ease of use, personalisation, navigation, availability and speed. • Who are you? 'About Us' is now a standard menu option. • What do you do? What products or services are available? • Where do you do it? Are the products and services available internationally?